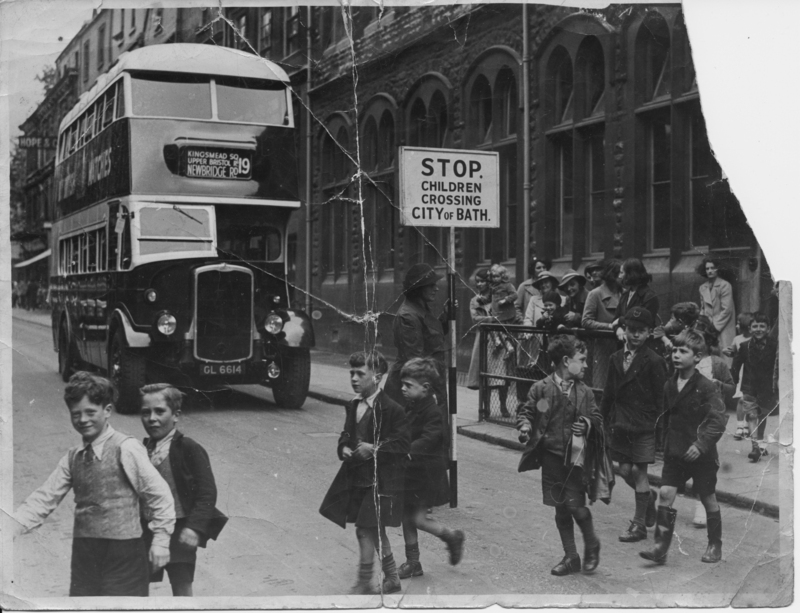 Back in August the Virtual Museum of Bath carried a story regarding the setting up of the School Crossing Patrol Service for Bath & North East Somerset Council which was celebrating 60 years of existence. On patrol at Kingsmead School in Bath – sixty years ago! Well – just recently – a newcomer to the website – Colin Hunt – caught up with that story. He has his own special memories of that diamond jubilee – contained in a photograph he has kindly shared with us. He has sent a copy of a slightly dog-eared but obviously much-loved photograph of his grandmother in action. ‘Not hugely clear of granny, but it shows Kingsmead School,’ says Colin. Thanks for that Colin. I am sure it will bring back memories for a lot of people.